Virtual event technology replicates all aspects of a physical event, such as presentations (keynotes, panel sessions, product demonstrations, etc.) that can include live Q&A, exhibition booths staffed live with booth reps and collateral, and networking opportunities. Virtual events also greatly extend the reach of the marketing efforts. It is much easier to get thousands to log on to a computer for a couple of interesting conference sessions than it is to get a few hundred people to show up in Philadelphia in early August for a physical event. But what really gets marketing people excited about virtual events is the marketing data. In the physical world, you are lucky if you grab a business card and scribble some notes on it or use a badge scanner to capture the name, title and company of a booth visitor. Virtual events offer true marketing intelligence, as there is web-based reporting that tells you everything an attendee did. You know which conference sessions they attended, how long they attended and questions they asked. You know what booths they visited, the collateral they downloaded and demos or other assets they viewed. You even have transcripts of conversations the attendee had with your reps. It is incredibly rich marketing data. Unlike other marketing vehicles where you might just capture registration information, virtual events deliver actionable intelligence that can fill the pipeline quickly. All of this data can be automatically ranked based on criteria you set, so you know who your hottest leads are and can assign them to your sales reps immediately. For example an attendee that watched two presentations and downloaded three pieces of collateral on a certain product could rise to the top of your lead qualification ranking and be contacted by a sales rep immediately. Take our client Quest Software’s first virtual event, which generated leads at a $23-per-head count. Marketers know that $23 per lead is a pretty impressive return on investment. And while generating demand was an objective for Quest Software, they had two other goals that marketers try to achieve. They are: establishing thought leadership in their field and building awareness. Quest Software has hosted two more virtual events since its first event in spring of 2007 and plans to add even more in the next year. Quantifying thought leadership and awareness is more difficult than determining the cost per lead. In these efforts, Quest Software feels the virtual event venue has helped them immensely. With attendance counted in the thousands, rather than the hundreds that other marketing vehicles generate, the company is able to deliver its message more efficiently. But most important was the positive feedback it received from prospects, customers and partners about the virtual event as a way to share knowledge. Dealing with business professionals, often C-level people, the virtual event platform needed to be scalable (accommodate thousands) accessible (some virtual event technology take can take up to a half hour to enter the environment correctly). Along with the web-based reporting these are important attributes to consider when selecting a virtual event platform. Virtual events are used to generate demand, as opposed to virtual “worlds” where people have time to go live a second life. While some companies have eliminated physical events, to reduce costs and carbon footprint, the end of all physical events is not near. And while virtual events can replace, but more often augment physical events it isn’t the comparison to physical events that you as a marketer need to consider. It is the twenty-something per dollar lead figure that this particular marketing tool delivers. In light of the current economic landscape, it’s now more critical than ever for marketers to attract the right prospects and help reduce the time it takes to close deals. One major effect of an economic lull is that buying decisions are delayed. As a result, marketing executives are faced with dwindling pipelines that actually need to be even bigger than in good times. With a limited ability to allocate money to lead generation, the emphasis is now on marketing tactics that can deliver high-quality leads cost-effectively. Savvy marketers understand that lead generation is not limited to the initial creation of interest. Rather, it refers to the full slate of nurturing activities necessary to grow a “suspect” into a prospect. But in order for marketers to efficiently track and drive leads through the customer lifecycle, they must leverage the right tools. Virtual events and environments are rapidly becoming more mainstream thanks to their ability to help marketers arm their sales counterparts with better-qualified and intrinsically higher-value “sales-ready” leads. One major advantage of a virtual environment, compared to traditional physical events (e.g. trade shows), is that every interaction of each attendee can be recorded and evaluated. For example, demographic information combined with detailed insight into an attendee’s virtual booth visits, chats with booth staff, collateral downloaded and presentations viewed, provide a level of lead qualification that is far superior to most other marketing initiatives. The best virtual environments allow marketers to measure the engagement level of their participants and rank all of their leads, so that immediate attention will be given to “hot” leads. 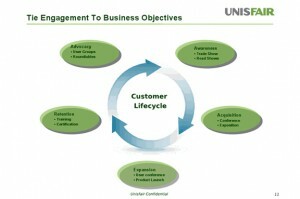 Companies can evaluate their prospects and customers on three dimensions: demographics, activities and interest. A simple point system helps organizers to customize the lead scoring mechanism for their needs. By defining lead ranking criteria upfront, they don’t waste time trying to make sense of their leads after the event is over. For example, a company’s marketing team could target CFOs from New England who attended a specific product session, downloaded a white paperand stated in a poll that they plan to make a purchasing decision in the next 90 days. It is also possible to compare engagement levels across events — whether they are awareness activities, or customer retention events — enabling marketers to make better decisions about how to optimize their marketing efforts. In addition to the ability to “track everything,” following are a few other things to consider when integrating a virtual environment into your marketing mix. 1. Focus on the big picture. Leverage a virtual environment during every stage of the customer lifecycle — from awareness to retention. This gives the customer an opportunity to not only learn more about your offerings, but also to discuss their experiences with each other and build a community, which in turn fosters customer loyalty. 2. Engage with attendees in a creative way. Hold surveys, polls, group chats and networking sessions to allow the exchange of ideas among attendees. This provides the ability to better assess their interest level in specific products, ideas or themes. Some organizers will send their attendees kits with t-shirts, coffee mugs and other trade show giveaways to recreate the feeling of a physical event, or even offer on-site catered lunches. 3. Follow up. The beauty of a good virtual event is that your registrants can visit it any time they like. Still, a number of registrants will forget that fact and may never log on to see the on-demand version. Use email and social networking tools to follow up with non-attendees, share some of the excitement and encourage them to join the on-demand environment. 4. Measure success. There are many different ways to measure the success of your event, which is ultimately determined by your goals. In July 2008, Brian Haven at Forrester Research established a framework of four metrics that include: involvement, interaction, intimacy and influence to measure the level of customer engagement. Be sure that you chose a virtual platform that allows you to report on customer engagement and other key metrics. Doing so can serve as a highly effective lead ranking mechanism for prospecting events and allows your sales team to directly assess the level of interest of its prospects. In short, virtual events and environments are a new and cost effective way to market, and generate sales-ready leads. It’s no wonder more and more marketers are beginning to embrace this technology and are happily reaping the many measurable benefits. Cisco Systems: Virtual Events – Reality or Hype?